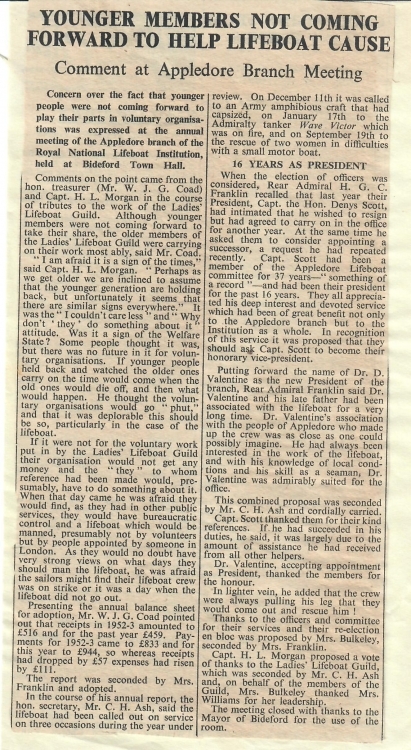 Good news mentioned in the Gazette in 1968! 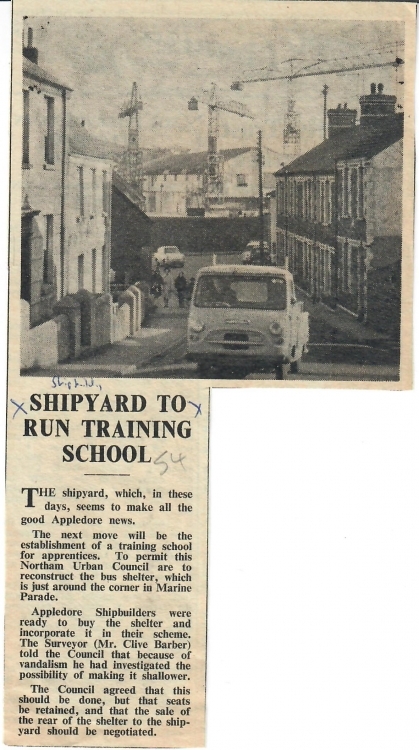 Appledore Shipyard is to establish a training school for apprentices. There was a distinct Scottish flavour about the naming this week of the 50th ship to be built by Appledore Shipbuilders Ltd.
Exeter Maritime Museum have offered to give a home to the Kathleen and May, the 77-year-old schooner with strong Appledore associations which the Maritime Trust are considering moving from Plymouth to London. The Trust say the viewing fees from the public visiting the schoome at Sutton do not cover maintenance costs and they think a move to London could remedy this situation. The Exeter Museum think she should stay in the area. Assembly of the framework of the replica of Drake's Golden Hind, being bult at the yard of J Hinks and Son, Appledore. The replica has been ordered by an American firm and the work of the building will take until next spring. 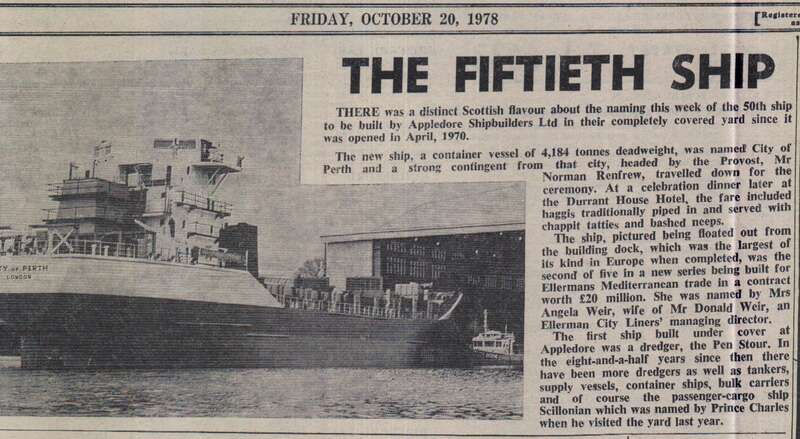 There was a distinct Scottish flavour about the naming this week of the 50th ship to be built by Appledore Shipbuilders Ltd. The new ship was named City of Perth and she was named by Mrs Angela Weir, wife of Mr Donald Weir an Ellerman City Liners' managing director. 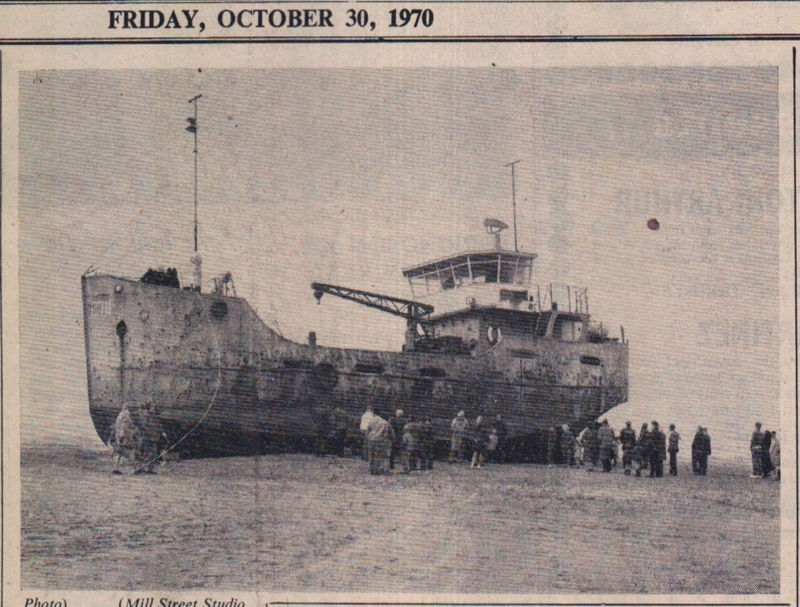 Converted from a landing craft (guns) to a mission ship, the "Sir Edward P Willis II" lying at the yard of Messrs P K Harris and Sons, Appledore, will, it is expected, be ready for sea in the very near future. Her reconstruction, which has been spread over two years, has been delayed by various shortages of materials, but this is now being overcome. Jauntily flying the skull and cross-bones at her stern, the ship, Hispaniola, which last summer was used in making the film "Treasure Island," left Appledore in tow for Scarborough where she is to become part of that Corporation's maritime display. Lieut-Com S Gorrell is in charge of the Hispaniola. Volunteer extra hand, who travelled all Friday night to get to Appledore, was Wing-Commander Cyril Johnson, of Birmingham. 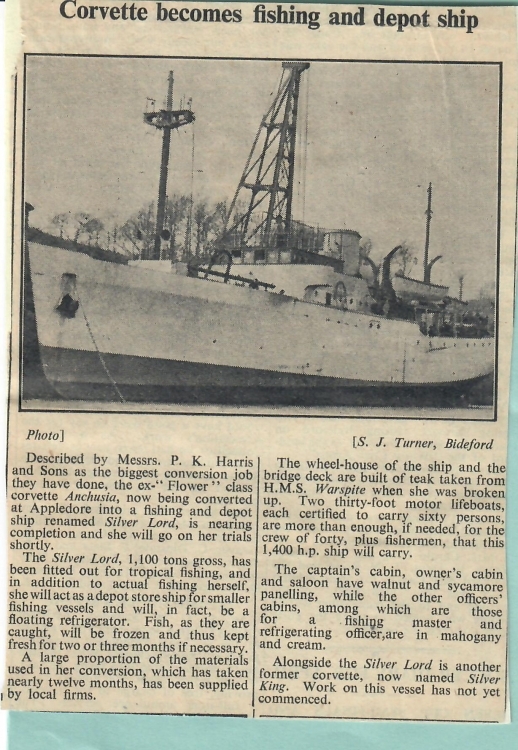 Described by Messrs P K Harris and Sons as the biggest conversion job they have done, the ex "Flower" class corvette Anchusia, now being converted at Appledore into a fishing and depot ship renamed Silver Lord, is nearing completion. Wheel-house of the ship and the bridge deck are built of teak taken from HMS Warspite when she was broken up. Alongside the Silver Lord is another former corvette, now named Silver King. Work on this vessel has not yet commenced. Pirates were taking the Treasure Island film ship Hispaniola on her last voyage from Appledore to Scarborough where the ship will become part of the town's maritime display. The Hispaniola was commended by Lieut Commander S Gorrell and manned by 2 Appledore seamen, Messrs E Bignell and Kelly Eastman, and a number of amateur sailors, Messrs W Glover, S Sanders, T R Davies and Wing Commander Johnson. 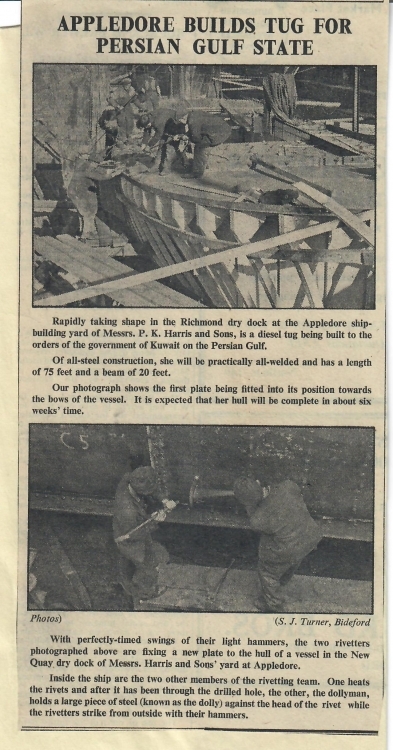 Picture of Richmond Dock of Messrs P K Harris & Sons Ltd, the old established Appledore firm, shows three tugs in course of fitting out or construction. In the background is the Alnwick, 4th of six vessels being delivered to Messrs France, Fenwick, Tyne & Wear Ltd, of Newcastle. The smaller hull on the left is of a tug ordered by the Iraq Petroleum Company. The Bamburgh is expected to be christened just before Christmas and the Mersden in the New Year. 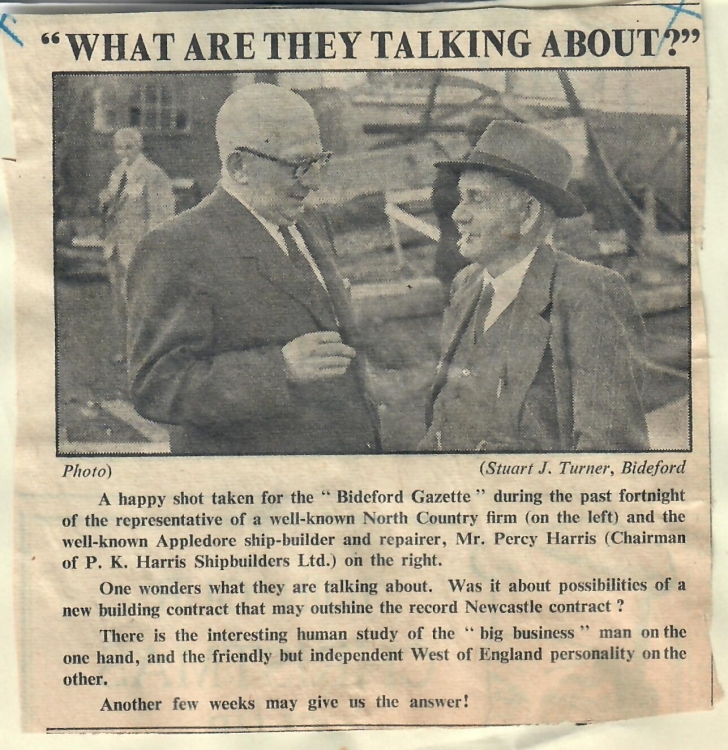 Photograph shows a representative of a well-known North Country firm (on the left) and the well-known Appledore ship-builder and repairer, Mr Percy Harris (Chairman of P K Harris Shipbuilders Ltd) on the right. 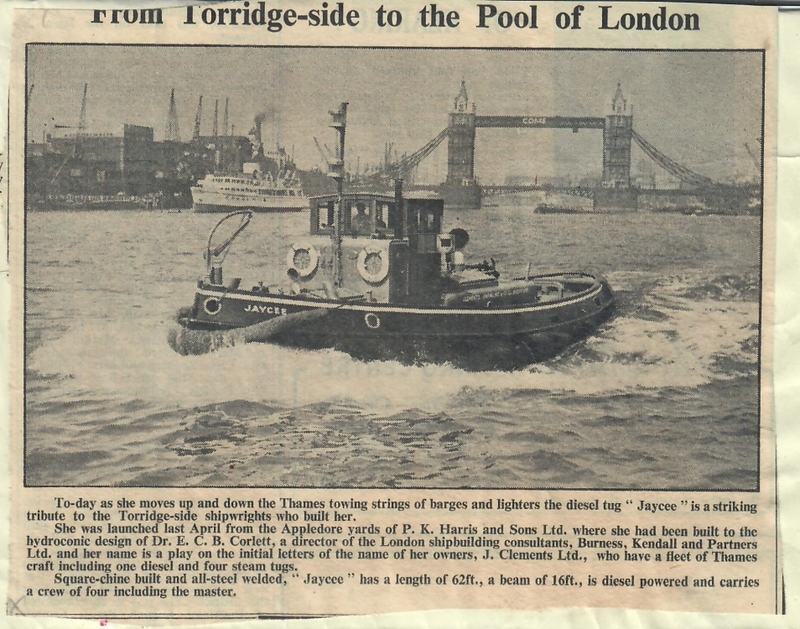 The above tug was successfully launched amid cheers of Appledore shipyard employees who have worked at concert pitch to ensure "being on time" as tide was the last suitable daylight tide before 1956. Picture shows Mr C H Gibson, the mechanical engineer for a large North-country tug-owning firm, consulting with Mr J Venus, Managing director of Messrs P K Harris (Shipbuilders) Ltd of Appledore, the builders of the new craft. The christening ceremony was performed by Mrs Gibson. Design by Messrs Burness, Kendall and Partners. 54 foot glass fabricated vessel, which was launched into the Torridge by crane, after arrival by road from Southampton, in June last, left Appledore last week after being fitted out at the Newquay Dock of Messrs P K Harris and Sons. She is destined for Aden. 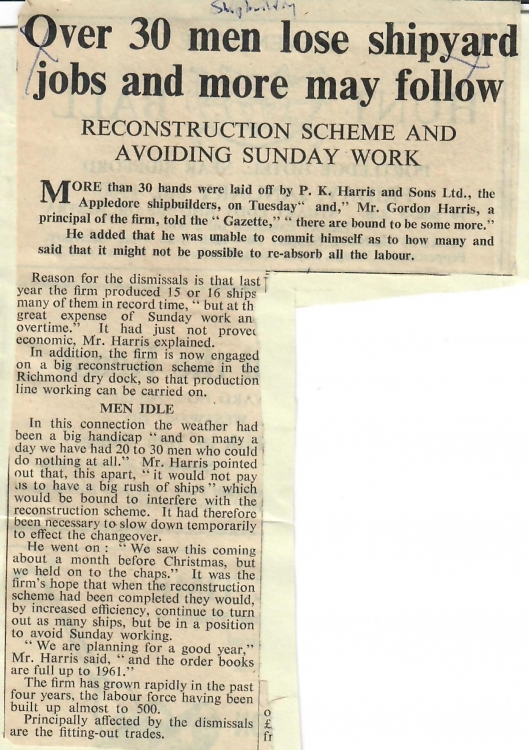 More than 30 hands were laid off by P K Harris & Sons Ltd, the Appledore shipbuilders. Mr Gordon Harris, a principal of the firm stated there are bound to be some more. Reason for dismissals is that last year the firm produced 15 or 16 ships many of them in record time, "but at the great expense of Sunday work and overtime." After the first stunning blow caused by the closure, literally at a moment's notice on Friday, of the Appledore shipyards of P K Harris & Sons Ltd, there has been much activity aimed at getting them reopened. Mr J E Williams, who has been appointed by Lloyds Bank as Receiver, at the request of the directors, is examining the position. Throughout Mr Percy Browne, MP who is convalescing at his London home, has been in close touch with the problem, as have other local leaders. 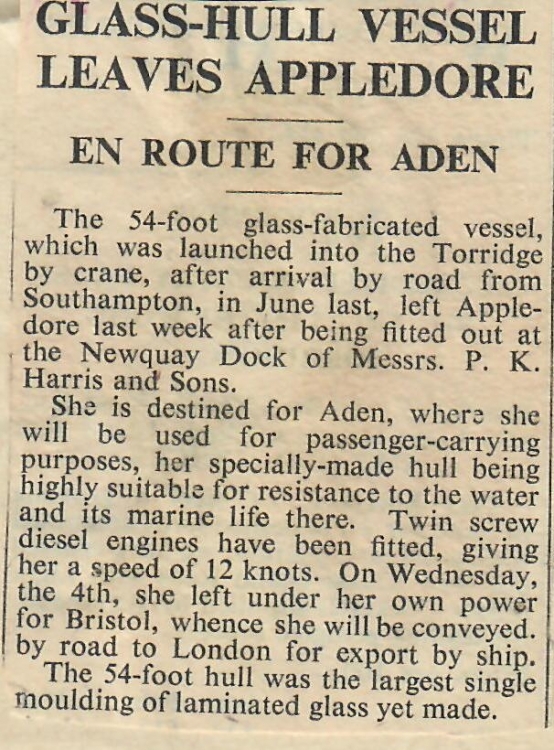 Most up-to-date of her kind in the UK, the largest ship ever to be built at the shipyards of Messrs P K Harris & Sons at Appledore was floated out of the dry-dock in which she was built, to the accompaniment of ships' sirfens and worken's cheers. The vessel was christened 'Sand Dart' by Mrs V G W Batt, wife of the managing director of the Southampton firm. Before the naming ceremony a bouquet was presented to Mrs Batt by Mrs Veree Kidd, daughter of the Richmond yard charge-hand Mr Jack Eastman. 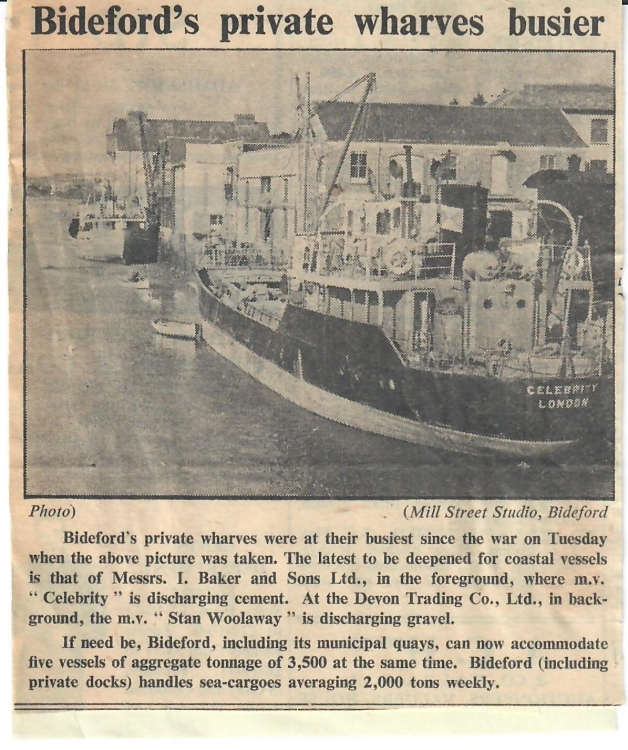 Bideford's private wharves were at their busiest since the war when the above picture was taken. The latest to be deepened for coastal vessels is that of Messrs I Baker and Sons Ltd, in the foreground, where m.v. "Celebrity" is discharging cement. 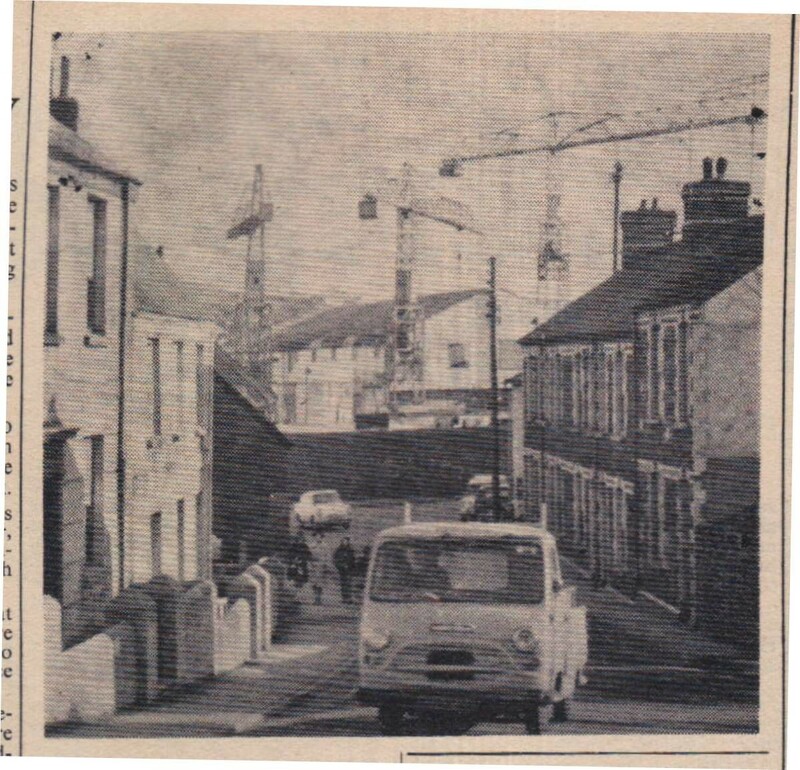 At the Devon Trading Co Ltd, in background, the m.v. "Stan Woolaway is discharging gravel. 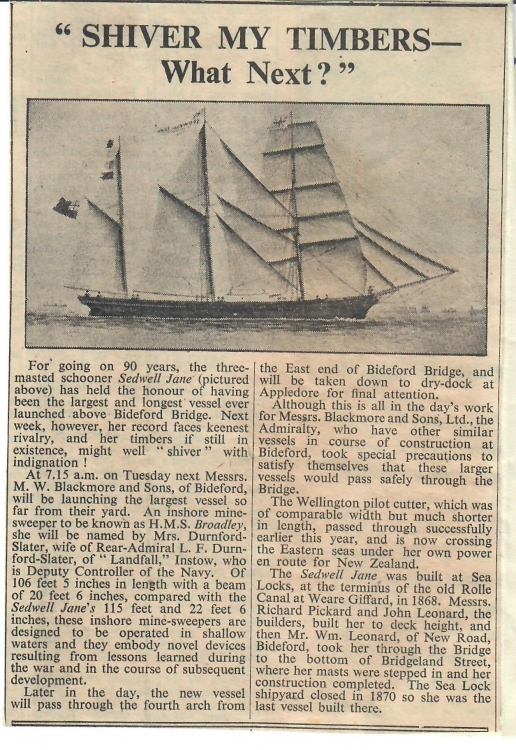 For 90 years, the three masted schooner 'Sedwell Jane' has held the honour of having been the largest and longest vessel ever launched above Bideford Bridge. Messrs M W Blackmore and Sons, Bideford will be launching the largest vessel so far from their yard. 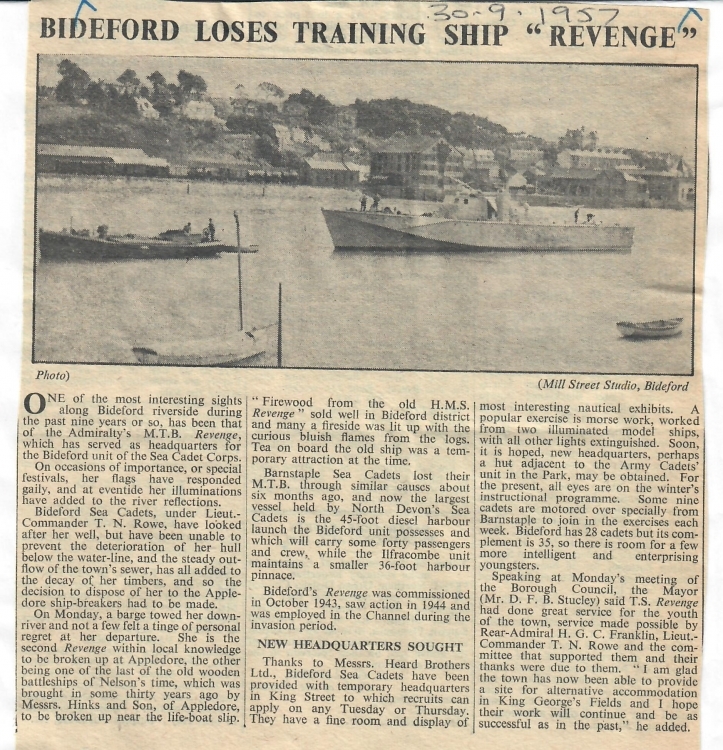 An inshore minesweeper to be known as HMS Broadley, whe will be named by Mrs Durnford-Slater, wife of Rear-Admiral L F Durnford-Slater, of "Landfall" Instow, who is Deputy Controller of the Navy. Bideford Gazette photographer catches Mr Stan Woolaway up the ladder supervising the installation of new radar and echo-sounding devices he is having installed on his sand dredger, named after him, and familiar to Torridge-side. 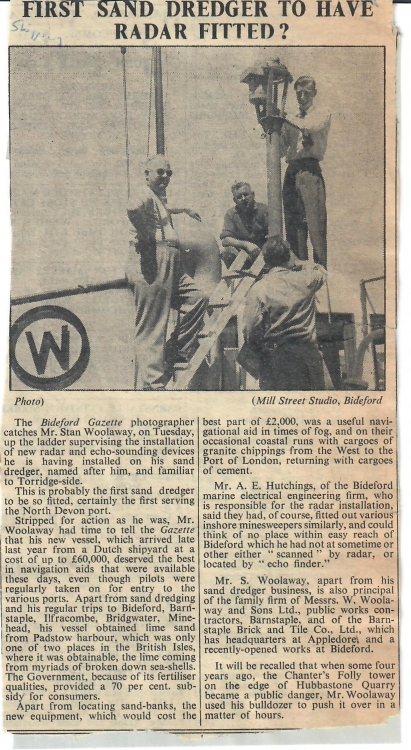 Mr A E Hutchings, of the Bideford marine electrical engineering firm, is responsible for the radar installation. "Jaycee" is a striking tribute to the Torridge-side shipwrights who built her. She was launched from Appledore yards of P K Harris & Sons Ltd where she had been built to the hydroconic design of Dr E C B Corlett, Director of the London shipbuilding consultants, Burness, Kendall and Partners Ltd.
"Jaycee" has a length of 62ft, a beam of 16ft, is diesel powered and carries a crew of four including the master. One of the most interesting sights along Bideford riverside during the past 9 years has been that of the Admiralty's M.T.B. Revenege, which has served as headquarters for the Bideford unit of the Sea Cadet Corps. Bideford Sea Cadets, under Lieut-Commander T N Rowe, have looked after her well, but have been unable to prevent the deterioration of her hull below the water line, and the steady out-flow of the town's sewer, has all added to the decay of her timbers. Managing Director of Appledore Shipbuilders Ltd (Mr J Venus) stated that the firm are to build three coastal tankers. The vessels for Shell Mex and BP Ltd are single screw steel motor tankers of 810 tons dead weight, with a length of 171ft 3in and a width of 34ft. The new vessels are "getting towards the limit fo what the yards are able to do" said Mr Venus. 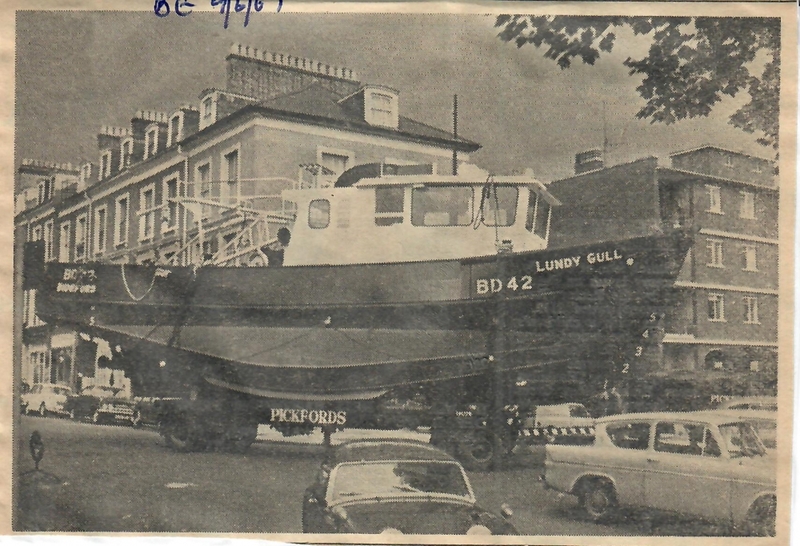 The 30 ton motor fishing vessel "Lundy Gull" pictured at Isleworth (Middlesex) near the end of its three day journey by sea, river and road from Appledore, for display at the World Fishing Exhibition, which opened at Olympia on June 1st. The biggest craft on show, "Lundy Gull" was built at the shipyards of Appledore Shipbuilders Ltd a member of the Court Line Group. 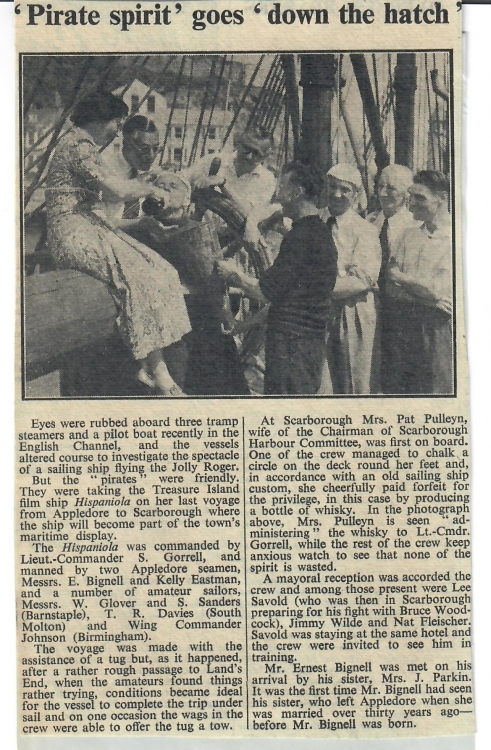 The shipyard seems to make all the good Appledore news. The establishment of a training school for apprentices. Northam Urban Council are to reconstruct the bus shelter, which is just around the corner in Marine Parade. 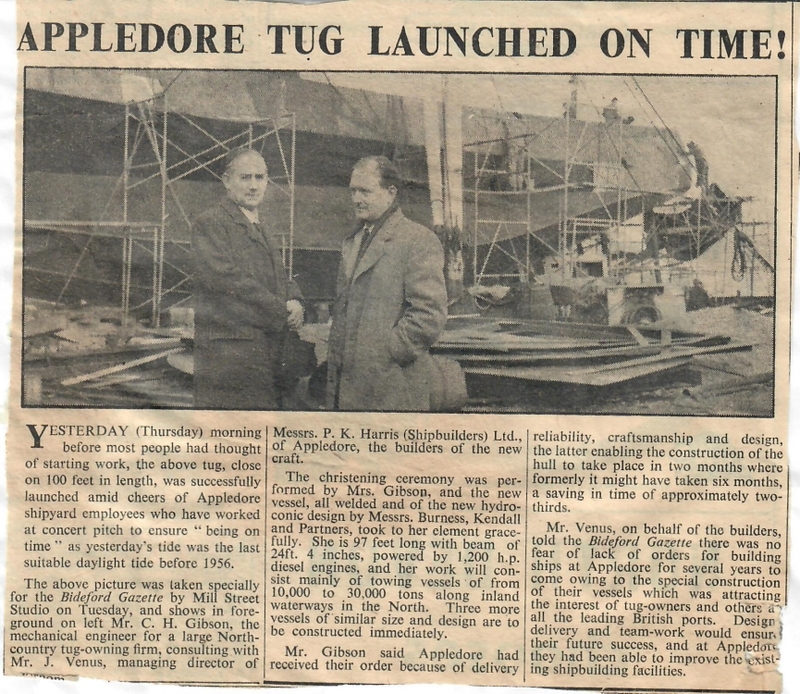 Appledore Shipbuilders were ready to buy the shelter and incorporate it in their scheme. The Surveyor (Mr Clive Barber) told the Council that because of vandalism he had investigated the possibility of making it shallower. An order for 3 coastal tankers worth a total of millions has been placed with Appledore Shipbuilders Ltd, Appledore, by Esso Petroleum Company Ltd. 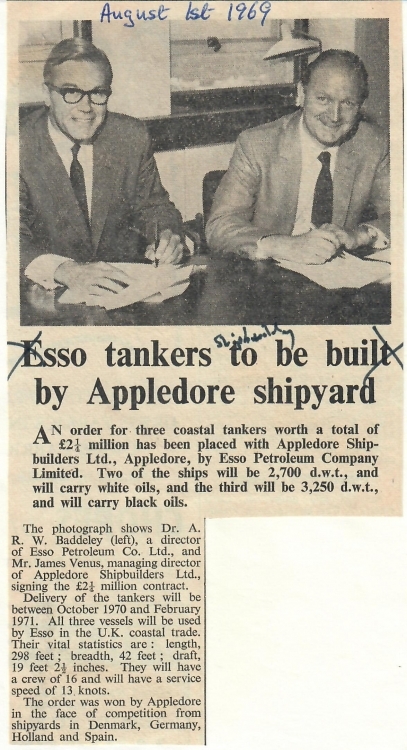 Photograph shows Dr A R W Baddeley a director of Esso Petroleum Co Ltd and Mr James Venus, managing director of Appledore Shipbuilders Ltd. Rapidly taking shape in the Richmond dry dock at the Appledore ship building yard of Messrs P K Harris & Sons, is a diesel tug being built to the orders of the government of Kuwait on the Persian Gulf. 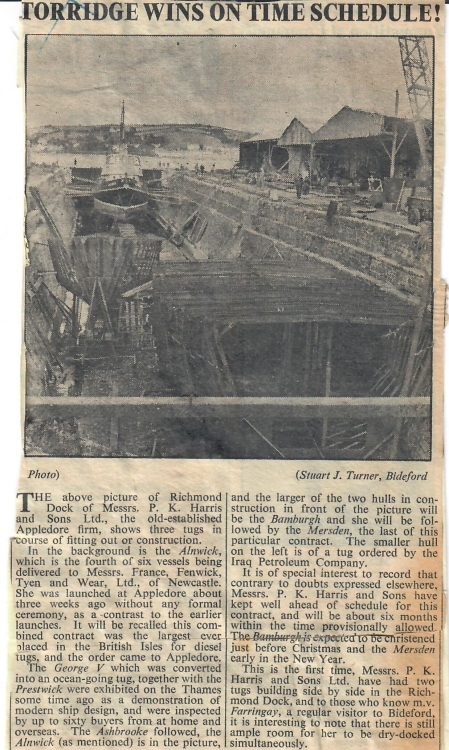 Photograph shows the first plate being fitted into its positon towards the bow of the vessel and inside the ship are two members of the rivetting team. How unusual it is to have two sets of twins working for the same company. Tony Schiller - better known locally as a Bideford FC player - and his brother David joined Appledore Shipbuilders as apprentices last August, on Sunday they celebrate their 18th birthdays. Also working in the yard are 35 year twins John and George Powe, who are both shipwrights. Mr Wan Sun Tae, Deputy Prime Minister of the Republic of Korea, discusses a point during his visit to Appledore Shipbuilders Ltd with the company's executive chairman, Mr Jim Venus, and managing director, Mr Joe Ball. 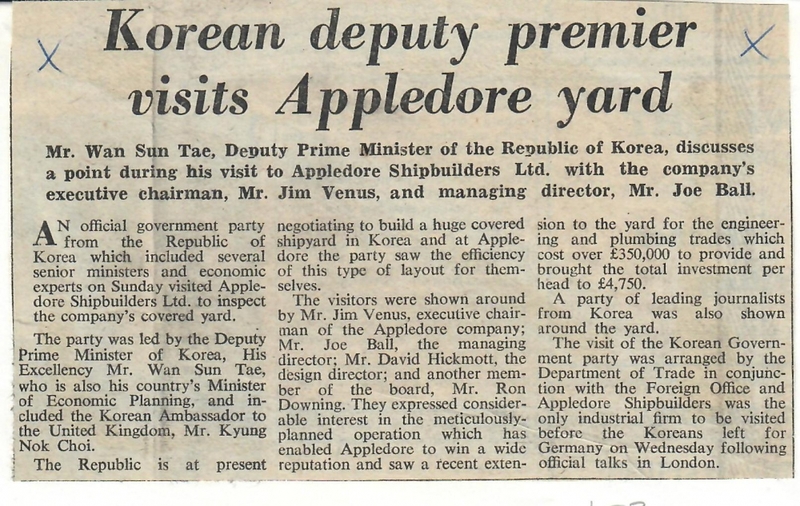 A party from the Republic of Korea visited Appledore Shipbuilders Ltd. The party was led by the Deputy Prime Minister of Korea included the Korean Ambassador to the United Kingdom, Mr Kyung Nok Choi. 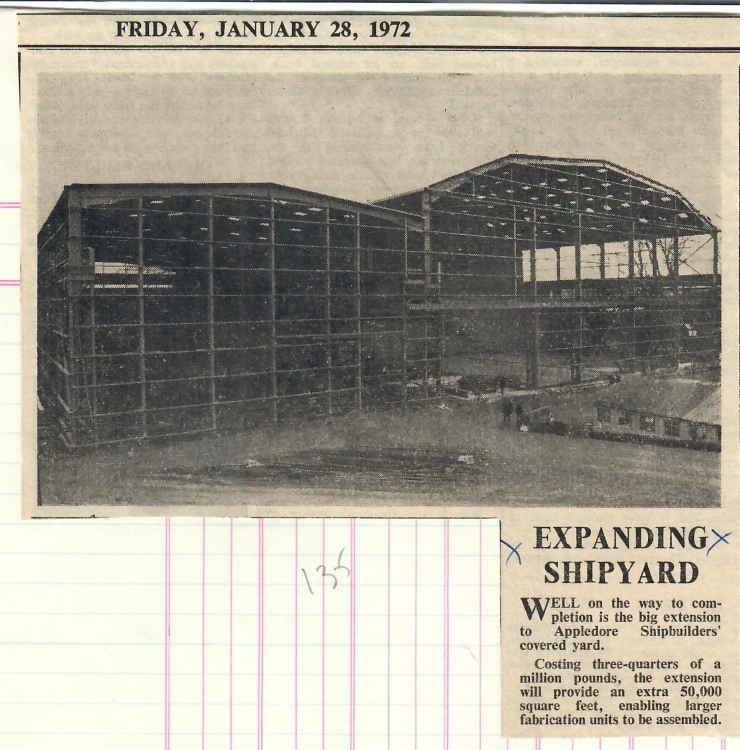 Well on the way to completion is the big extension to Appledore Shipbuilders' covered yard. Costing three-quarters of a million pounds, the extension will provide an extra 50,000 square feet, enabling larger fabrication units to be assembled. Hundreds of people have been making a daily trek to Westward Ho! to look at the stranded C711, a former Admiralty auxiliary tender which went ashore on the sands near Sandymere after her anchor chain had snapped while waiting near the Fairway Buoy to go into Appledore. The Pebble Ridge has provided a natural grandstand for spectators to watch the efforts made to re-float the vessel, which has two men on board. 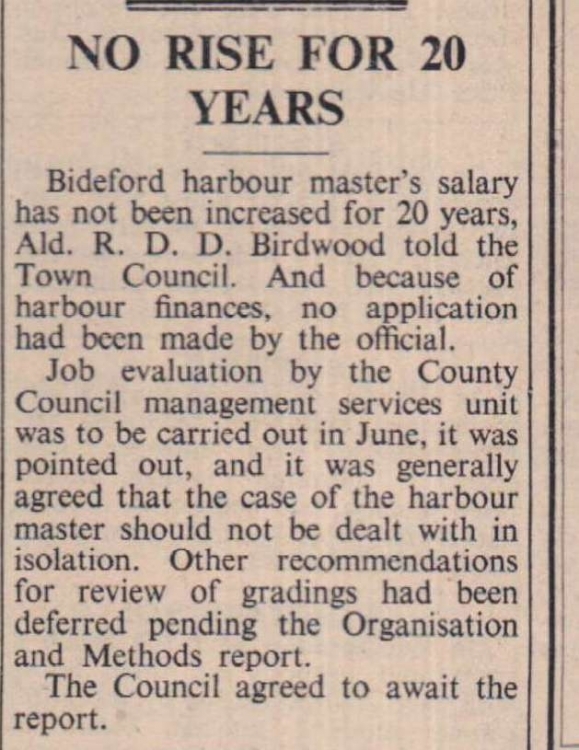 Bideford harbour master’s salary has not been increased for 20 years, Ald R D D Birdwood told the Town Council. And because of harbour finances, no application had been made by the official. Job evaluation by the County Council management services unit was to be carried out in June, it was pointed out, and it was generally agreed that the case of the harbour master should not be dealt with in isolation. Other recommendations for review of gradings had bene deferred pending the Organisation and Methods report.The Council agreed to await the report. In the past, big outside shipping firms, including the Reardon-Smith Line, have registered large vessels at Bideford which have never had a hope of coming up the Torridge. 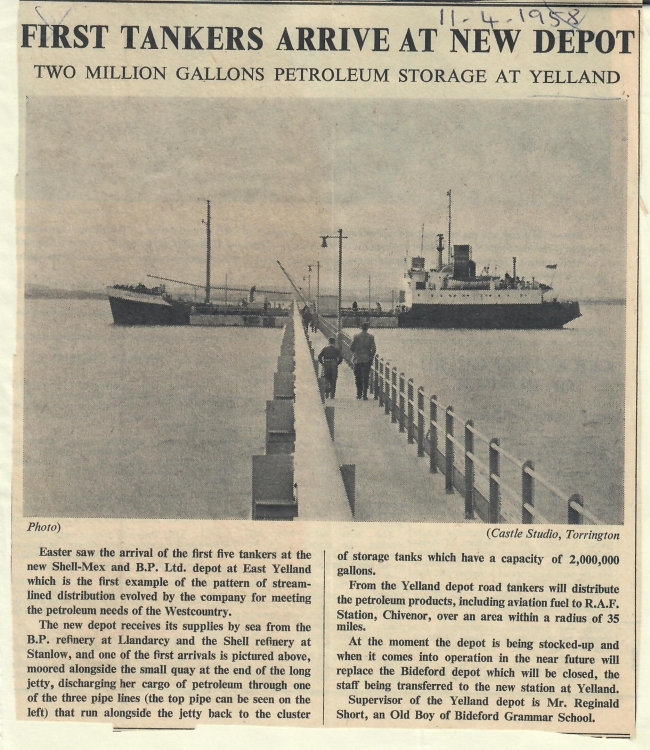 Lloyds Register of Shipping for 1958 features the 40,900 ton tanker ‘Bideford’ built by Kockums MV at Malmo for the Bideford Tanker Co. Ltd and registered in London. Product of the craftsmen of Appledore Shipbuilder Ltd the 10,500 ton Tankerman, a multi-purpose products tanker build on the Torridge for Rowbotham Tankships Ltd was named in Pool of London - the first time a naming ceremony has been held away from the yard. 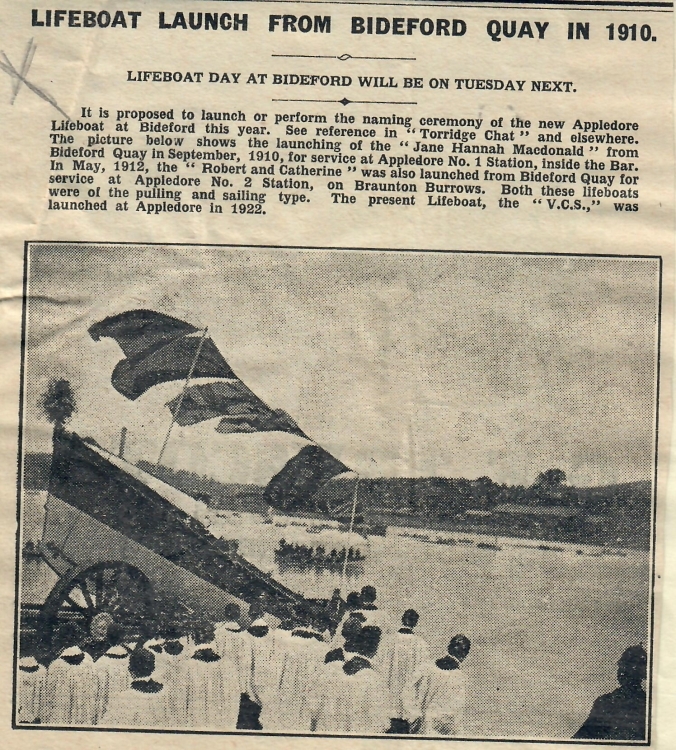 Naming ceremony of the new Appledore Lifeboat at Bideford this year. Picture shows the launching of the 'Jane Hannah Macdonald' from Bideford Quay in September 1910, for service at Appledore No. 1 Station, inside the Bar. In May 1912 the 'Robert and Catherine' was also launched from Bideford Quay for service at Appledore No. 2 Station, on Braunton Burrows. New boat arrived from the builder's hands. It was a real gathering of the clans and the remarks made by the President of the R.N.L.I. branch, Mr J C Hilton, brought back many happy memories of their boyhood days. 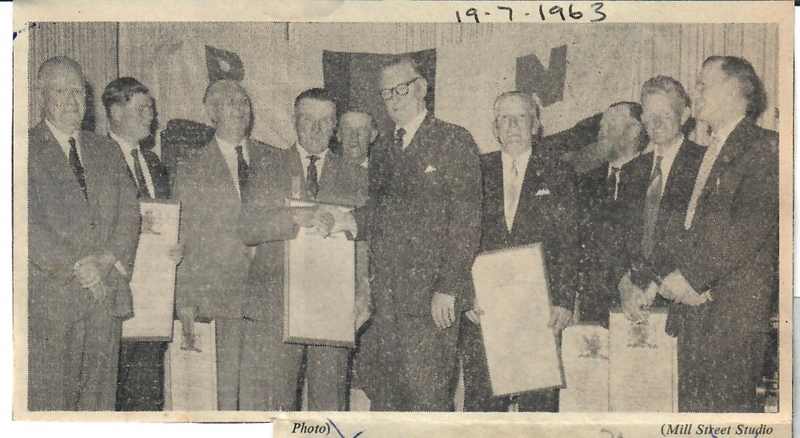 At a supper party at Appledore Hall on Friday night when Mr Sidney Cann, the coxswain of the Appledore lifeboat, and his crew were presented with the Royal National Lifeboat Institution's certificates of merit on vellum. The awards recognised the part they played in going to the assistance of the crew of the Admiralty tanker Green Ranger which went aground at Hartland last November. With veteran coxswain Mr Syndey Cann at the helm, Appledore's new lifeboat crossed Bideford bar on Tuesday at the end of her journey from the builder's yard in the Isle of Wight. She was christened 'Louisa Anne Hawker' at Bideford. Commander H H Harvey, district inspector of the RNLI, who was in charge of delivery, went out with a full crew to acquaint them with the layout. 'Dismay' of Northam Urban Council has been expressed to the Royal National Lifeboat Institution following the decision to christen the new Appledore lifeboat at Bideford. 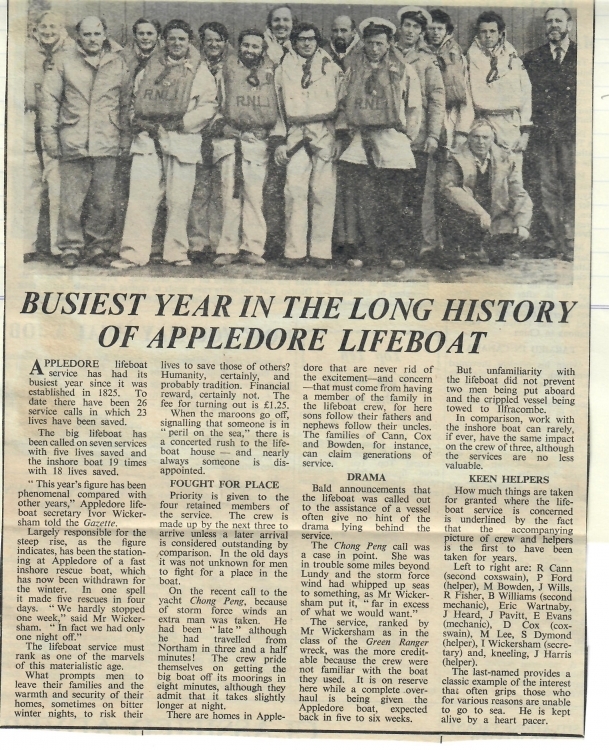 The planned marathon row by the Cox brothers of Appledore, reported on the front page of this issue, and the discovery that it will virtually coincide with the first ever rescue by an Appledore lifeboat, prompted research that has brought to light fascinating details. Lifeboat station at Clovelly is to be closed at the end of March. Decision by the RNLI Committee of Management, follows consideration of the whole future of the lifeboat service in the Clovelly area, and it has been made despite a strong fight put up by local branch committee. 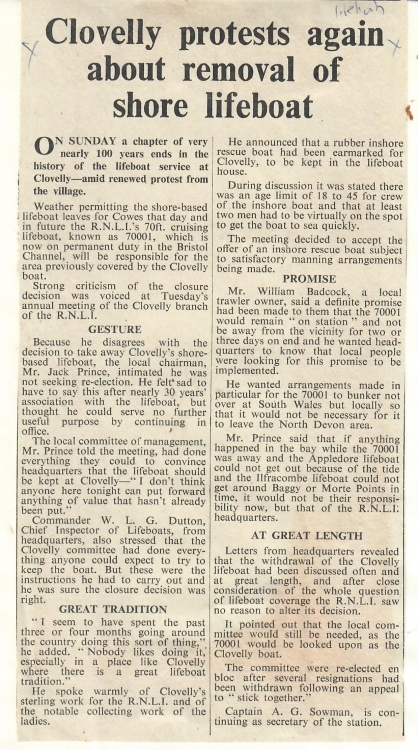 There has been a lifeboat station at Clovelly for nearly 100 years and Mr Jack Prince, the branch committee chairman, said that the R.N.L.I's decision had upset the villagers considerably. A claim for salvage is being made by Appledore lifeboatmen following the incident when they helped the 900 ton coaster "Woodlark" aground off Morte Point to safety. 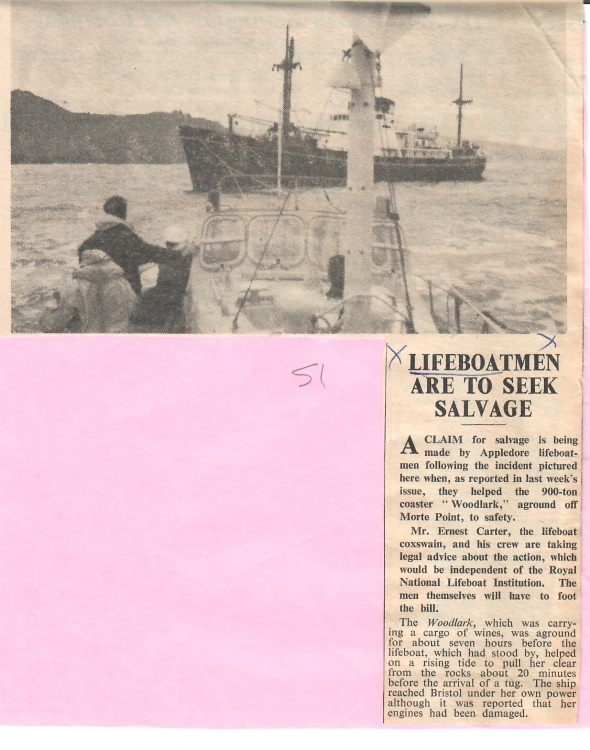 Mr Ernest Carter, the lifeboat coxswain, and his crew are taking legal advice about the action, which would be independent of the Royal National Lifeboat Institution. The men themselves will have to foot the bill. A chapter of very nearly 100 years ends in the history of the lifeboat service at Clovelly - amid renewed protest from the village. 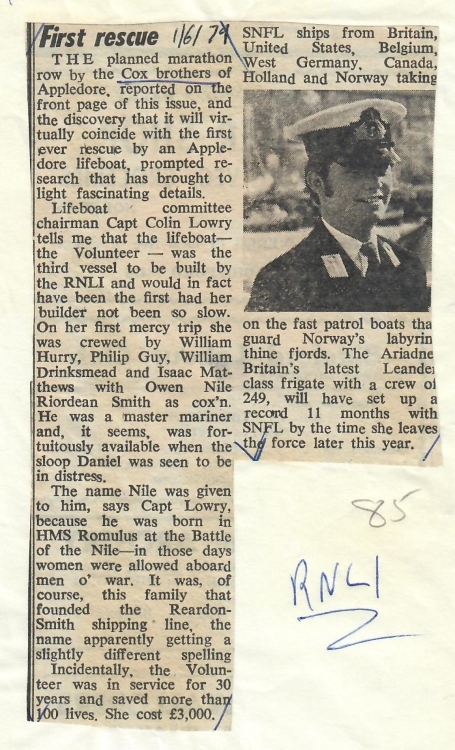 Weather permitting the shore-based lifeboat leaves for Cowes that day and in future the R.N.L.I. 's 70ft cruising lifeboat, known as 70001, which is now on permanent duty in the Bristol Channel, will be responsible for the area previously covered by the Clovelly boat. 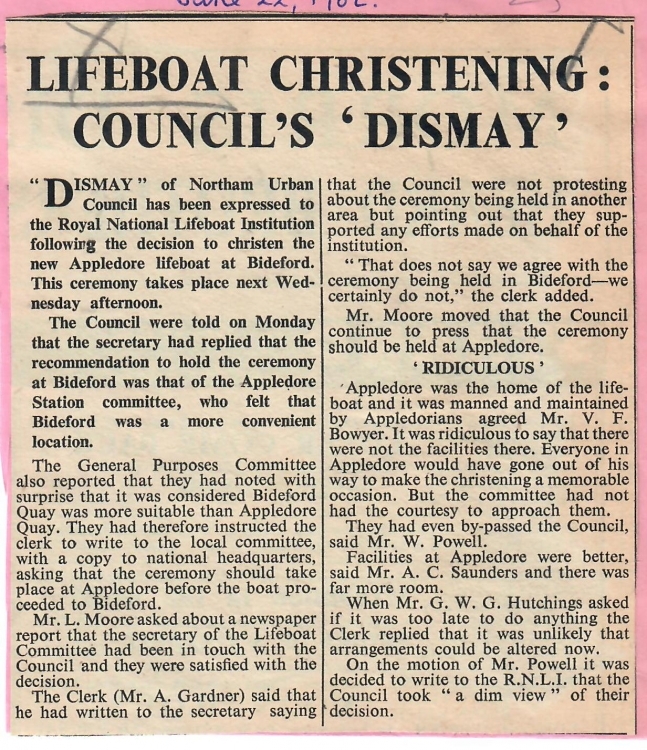 Because he disagrees with the decision to take away Clovelly's shore based lifeboat, the local chairman, Mr Jack Prince, intimated he was not seeking re-election. Suggestion that the revolutionary cruising lifeboat that is to be brought to Appledore around Christmas represents an immediate threat to the existence of lifeboat station in the Bristol Channel area is 'nonsense'. This is an experimental type of rescue cruiser, of which two are being built. For some time there has been rumoured a plan to station a cruising lifeboat in this locality, with permanent crews as on lightships, to serve the Bristol Channel area. The centenary of Clovelly lifeboat station will be marked by celebrations next week culminating in the presentation of a vellum from the committee of management of the Royal National Lifeboat Institution. The lifeboat housed in Clovelly boathouse was withdrawn on March 31st 1968, but the cruising lifeboat 70-001 has since been based there, and Clovelly continues as a lifeboat station providing shore-base facilities. The crew of Appledore's inshore rescue boat "Wildenwrath Whizzer" can look forward to a restful winter after a hectic summer in which they made 24 rescues. The "Whizzer" will be taken to Poole at the end of the month for annual servicing ready to resume her duties next March. (sorry article does not include crew names). Concern over the fact that younger people were not coming forward to play their parts in voluntary organisations was expressed at the annual meeting of the Appledore branch of the RNLI held at Bideford Town Hall. The Torridge has seen many strange craft come and go but none more unique than the children’s Noah’s Ark pictured above on her Board of Trade trials on the river on Friday. Painted in bright colours, the Noah’s Ark was built by Messrs M W Blackmore and Sons, of New Road, Bideford, to the orders of Weston-super-Mare Corporation for use on the town’s Marine Pleasure Lake. The cartoon figures seen in nautical garb are the work of Mr Charles King, the Bucks Mills artist. After weeks of uncertainty the Bideford boatbuilding firm of M W Blackmore and Sons Ltd is to go into liquidation, a meeting of shareholders has decided. The managing director, Mr Harold Blackmore, said that at a meeting of creditors on Friday no one had any alternative to put forward. 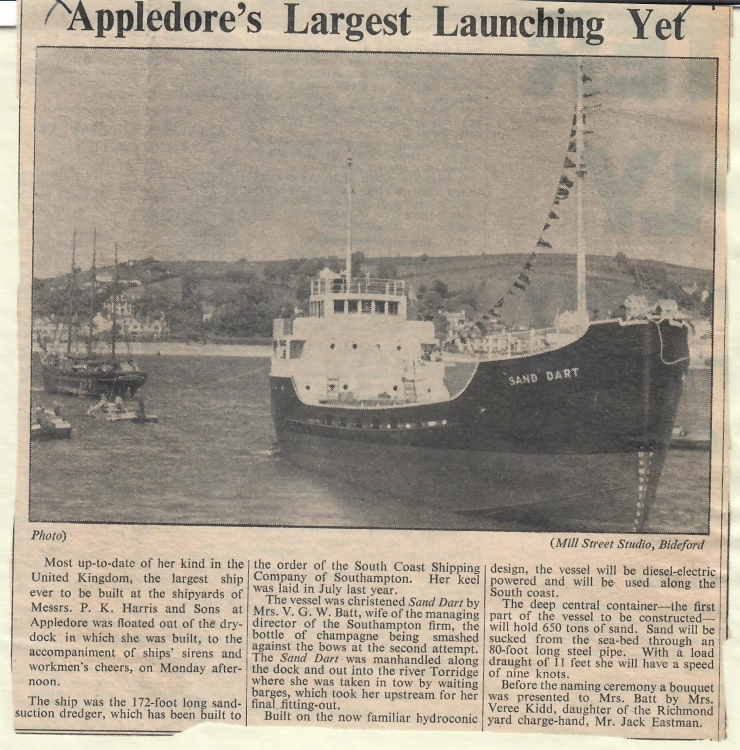 The family business, which was founded at Appledore in 1870, has been Bideford’s biggest employer of labour. 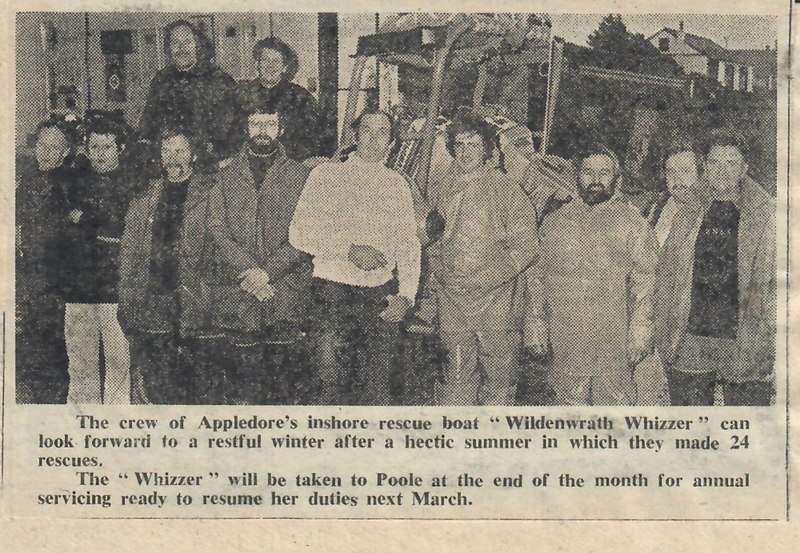 Appledore lifeboat service has had its busiest year since it was established in 1825. To date there have been 26 service calls in which 23 lives have been saved. In one spell it made 5 rescues in four days. "We hardly stopped one week," said Mr Wickersham. On the recent call to the yacht Chong Peng, because of storm force winds and extra man was taken. Bideford Shipyard Ltd have just completed a vessel for HM Customs. Successful trials of the ML Guardwell were completed last week and she is to be delivered within the next few days to the Customs authorities at Plymouth. Sixty feet long, she has a speed of 11 knots and is extremely manoeuvrable, being capable of turning round at nearly full power in 1½ times her length. Appledore's new lifeboat, which has undergone engine trials, will, it is hoped, be ready to leave the yards of her Isle of Wight builders next month. Provisional date for delivery is May 15th. Easter saw the arrival of the first five tankers at the new Shell-Mex and BP Ltd depot at East Yelland which is the first example of the pattern of streamlined distribution evolved by the company for meeting the petroleum needs of the Westcountry. The new depot receives its supplies by sea from the BP refinery at Llandarcy and the Shell refinery at Stanlow. From the Yelland depot road tankers will distribute the petroleum products, including aviation fuel to RAF Station, Chivenor, over an area within a radius of 35 miles.